Sharia Law Halal is contrary to Western democracies for at least three reasons. First, in Western countries the humane treatment of the animals is regulated by governments to ensure safety for the consumer and to protect animals from pain and fear during the slaughter process with all available means possible. In contrast, Sharia Law’s Halal slaughter process is considered inhumane by almost every world authority on animal welfare, and is banned in many otherwise tolerant countries like Sweden, Norway, Iceland, Switzerland, Poland, and Denmark. It is opposed and banned because the Islamic religious ritual requires the animal to be alive when the slaughter process begins causing the animal unnecessary pain and fear. In Sharia Law’s Halal, the humane treatment of the animal is secondary to the Islamic religious ritual which rejects 21st century means to ensure that the animals do not experience pain and fear. Second, as a religious ritual, Sharia Law’s Halal is also contrary to the tenant of Western democracies that separates church and state. 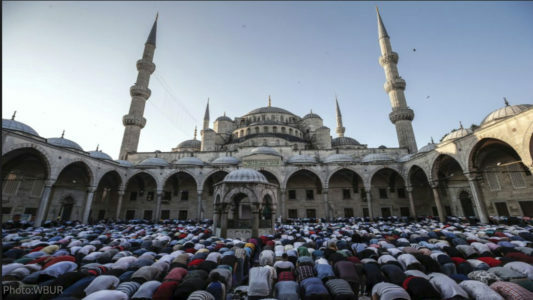 Public institutions like hospitals and government officials cannot promote nor appear to promote a particular religion as PM Trudeau has for a Halal company. Nevertheless, these Halal meat products are ultimately served in public institutions, and an unknown percentage makes its way to our grocery meat counters where people of different faiths, unaware a religious ritual has been performed over it which they may oppose, end up purchasing it. 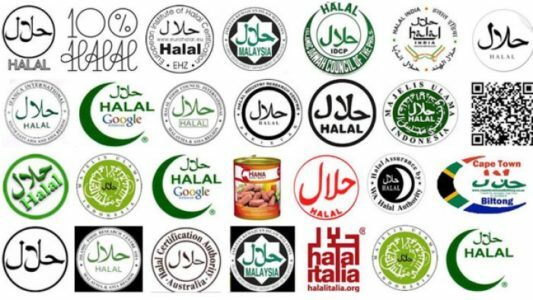 A third concern is links to terrorist funding by Sharia Law Halal “authorities” whose role is to visit the meat processing plants and certify that meat products sold as Halal followed the Sharia Law dictates. This includes: live animal slaughter; and, the performance of the religious ritual. 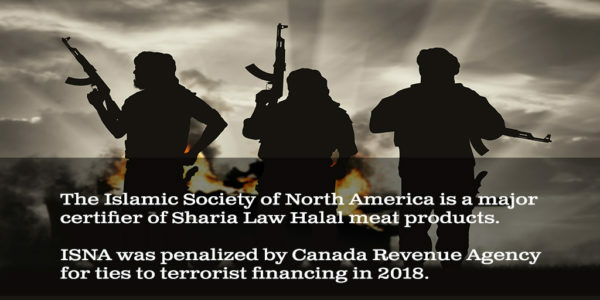 The Islamic Society of North America (“ISNA”), a major Halal certification authority, was penalized by the Canada Revenue Agency for its ties to terrorist financing. This may explain links to the exponential growth of Sharia Law Halal. Halal is growing at an exponential rate that far exceeds the population of Muslims in Western countries. For example, in Canada the Muslim population is somewhere north of 3.25%, yet (although the data is murky) at the very least 15% and realistically 30% of meat in Canada is Halal slaughtered meat. This article outlines the statistics for the U.K. Some of the explanations being offered for the disproportionate amount of Halal slaughtered meat is that a percentage of that meat is exported to Muslim countries;and, it’s more cost effective for meat processing plants to do all Halal rather than have a separate production line of non-Halal. Another reason, identified in a report by the Alberta Ministry of Agriculture and Forest on the Halal industry in Canada, states that it is also because millennials and other non-Muslims are buying Halal meat based on marketing that says it is wholesome. “In Canada, Halal food sales exceeded $1 billion in 2017 and that will likely continue to grow rapidly. This series of posts intends to provide information for you to have a voice on this issue by speaking with your wallet. You can choose to buy meat products that adhere to the Canadian standards which give clear and unambiguous priority to the humane treatment of animals, and which do not have a religious ritual performed on them that might violate your religious beliefs; and, are not linked to terrorist financing. This first post focuses on the first issue, the humane treatment of animals. Other posts will follow on the imposition of Islamic religion, and the links to terrorist funding. The topic of animals in the slaughter process is not an easy one; however, these issues are now in the mainstream media in the UK, and almost certainly will be in Canada as well in the near future. It needs to be addressed for the sake of non-Muslims, moderate Muslims who have gone to the extent of vegetarianism to sidestep the issue of Halal slaughter;and, most importantly respect for the lives of these animals. Click here for grocery store products, and public institutions selling Sharia Law Halal products. Click here for a letter drafted to the Canadian Government to provide equal Halal labeling for non-Muslin consumers. What is Halal Slaughter Exactly? The below leaves out the graphic details of the slaughter process, but does include enough information to convey the treatment of the animals based on research articles by the world experts on the slaughter process. Specifically, with regards to cattle, Canadian law requires the animals be pre-stunned. According to the experts, this process is about the equivalent of being shot in the head with a gun, rendering the animal immediately, not only stunned unconscious, but irrecoverably impervious to pain and fear, in all but rare circumstances where a second bolt must be applied. This method strives to ensure the animal will not suffer pain or fear in the slaughter process. Sadly, in the area of 6% of animals are not properly stunned. Also, in spite of the laws and regulations mistreatment of animals occurs in meat processing plants or “abattoirs.” However, Canadian, British, Australian, etc Western countries regulate these practices and hold those accountable who break the law and cause unnecessary pain and fear in the animals. In direct contrast to the standard Western practices for abattoirs, Sharia Law dictates that the Halal process requires the animal be alive when slaughtered to meet the Islamic religious requirements. Almost every animal welfare organization in the world, including The Canadian and British Veterinary Association have consistently opposed non-stunned animal slaughter because it has scientifically been proven over and over that non-stun Halal slaughter causes unnecessary fear and pain in the animal. 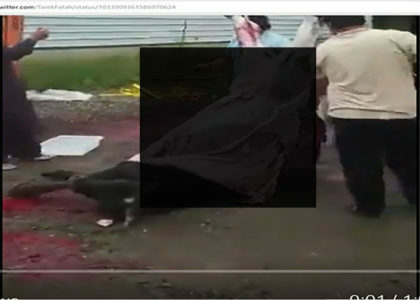 Non-stunned slaughter is the slaughter of animals that is depicted around the Islamic celebration of Eid and the backyard slaughter of live animals. This is an article that includes a video – with a warning that it is disturbing – which is a Canadian example of a slaughter around Eid, if you need to see this for yourself. Note that this is not to say that Sharia Law wants for the animal to suffer. That has never appeared to be the case. However, in Sharia Law Halal, the religious ritual is given priority over the slaughter method. Halal slaughter has been banned as a result in many countries, even otherwise bulwarks of Islamic support like Sweden have banned Halal slaughter because of its inhumane treatment of animals. This is an excellent Sept 9, 2018 article by the Globe and Mail with regards to Sharia Law Halal slaughter. 2.1 Sharia Law Halal: “Reversible Stunning” Slaughter Cattle and other animals are still alive, but they are temporarily stunned so that the animal does not experience pain and fear – as long as the slaughter is completed within 15-23 seconds. Some or most Islamic Sharia Law Authorities appear to have made somewhat of a concession on the stunning of cattle (and other animals), although it is a grey area. 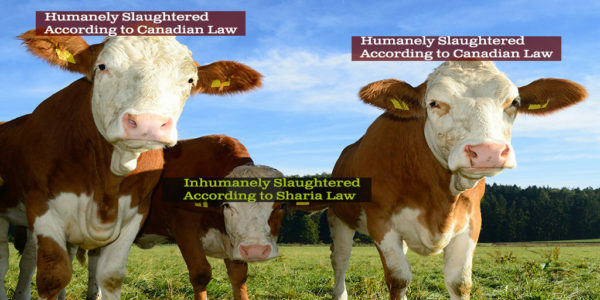 In this method the animal is still alive, so it meets the Sharia Law religious criteria, and would remove the issue of fear and pain for the animal, but there is a big catch, as I read between the lines of Prof Grandin, a recognized expert on cattle. This process is only humane – as long as the animal is slaughtered within 15-23 seconds. Otherwise the animal can recover (reversed stunning) into a horrific circumstance of pain and fear. Reading through articles by experts, which were perhaps written with a political correctness filter, it seems that reversible stunning side steps the “Pre-Stunned”, captive bolt” method’s near certainty the animal is impervious to fear and pain, by gambling that the slaughter will occur within 15-23 seconds for each animal. Does the slaughter of the animal happen within 15-23 seconds in the meat processing plants: some of the time? most of the time, rarely? It apparently depends on factors such as the skill of individual workers and the restraint methods as to whether the animals experience a horrific death or a painless death. There is little to no data. There are, however, red flags that Halal meat processing plants who were given special concessions for the traditional Halal Non Stunned slaughter are abusing the privilege granted to them to slaughter a small number of animals in the non-stun method, and are slaughtering more animals than Islamic demand indicates. Australia, which exports most of the world’s lamb and is almost 100% Halal, has flagged this as an issue. There have been horrifying videos of live lambs being slaughtered coming out of Australia. Be informed when reading what Sharia Law Halal websites say about their process. 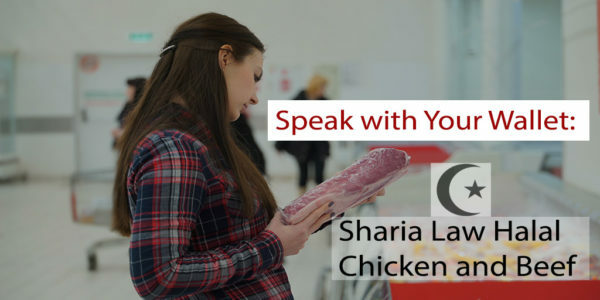 Sharia Law Halal processing authorities and Halal slaughter meat processing plants have nice verbiage on their websites that say they are entirely concerned with the welfare of the animals and the animals are generally, mostly pre-stunned making it a painless process. The language is general and non-committal on most Halal websites. The reference to pre-stunning perhaps refers to the Sharia Law Halal 2.1 method of “Reversible Stunning” above. While there are Sharia Law Halal meat processing plants that are using a stun method of some kind, there is still a disproportionate amount of Halal slaughtered animals that were “Non-Stunned’ to satisfy the Islamic Sharia Law religious ritual. This article describes what is probably a typical response from a Halal meat processing plant: most of Halal slaughtered animals are pre-stunned; and, you’re a right-wing Islamophobic bigot for asking. We should, and need to, push past the political correctness and ask these questions for the sake of the humane treatment of animals, as many or most moderate Muslims agree. We need to also support meat processing plants that adhere to the highest level of ensuring animals are slaughtered without pain and fear that is available to us as caring humans. The “Pre-Stunned” Captive Bolt method is consistently referred to first and as “preferred” in expert articles discussing animal welfare. It seems there is a general sense of tolerance to the 2.1 “Reversible Stun” methods, but they are not embraced. What is clear, is that animal welfare experts near unanimously are clear that the Non-Stun Sharia Law Halal slaughter is inhumane. Click here for list of products in grocery stores, and public institutions selling Halal products. Note that Halal meat products may not be identified as Halal in the grocery store. There is a push in the UK to require labeling indicating whether the animal was stunned (did not experience pain and fear);or, was not stunned using the Sharia Law Halal method (experienced pain and fear). An article on the Islamic religious ritual performed on the animals, terrorist funding, and the economics of Halal, will follow. Click here for past articles and videos on Halal. This Facebook account appears to have a good selection of various materials on Halal. I can’t vouch for it, only because I haven’t had time to go through it all, but it appears reliable. This entry was posted in Halal Islamic Sharia Law, Islamic Activism, Sharia Law in Canada, Religious Freedom and Christianity, Think Over News and tagged canadian law, halal, humane treatment of animals, sharia law, what is halal, where can i buy halal.